The SCI runtime provides some logging / tracing capabilities for technical analysis and error handling out of the box. However, I always wished to have more insights into the results and outcome of the message processing. So I developed a mechanism to write information into a separate logfile and attach that to the message during runtime. Thereby the outcome of the message processing can be easily obtained from the operations view perspective during runtime. The general method can be used for various use cases and shall be seen as a pattern. 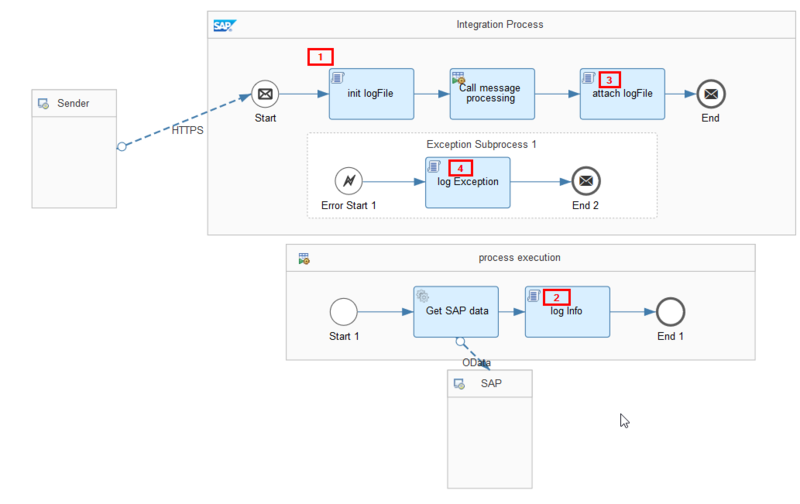 The example scenario in this blog is an iFlow to retrieve material master data from SAP ERP and further process it (out of scope here). The iFlow should write the number of material data retrieved and log out the material numbers. I use a groovy script to create a String (log file) and store it as a message property during runtime. At every point in the IFlow process you can add log messages to the log file by using groovy script. After the IFlow process is completed, the log file is finally attached to the message log as an attachment. In case of an exception (the exception might be logged as well) the IFlow is terminated exceptionally. So the log file must also be attached to the message log. The outcome of the iFlow is visible in the Message Monitor. The number of entities and the list of materialnumbers can be found in the log file. I found the advanced logging very helpful to comprehend and monitor the message processing. I mainly use it to log out cumulative information of the process like the number of entities retrieved from an Odata service or the routing of the message during runtime. There are endless possibilities to use the logging and I hope it will benefit you. But please keep in mind to not log out sensitive business data, as it will be visible to individuals who can access the HCI runtime (data protection). How do you manage logging of information? Any other suggestions? I find this way of logging very useful when used temporarily. However when this is used extensively, you will encounter the limit of the Circuit Breaker. The threshold for Circuit Breaker is capped to 1GB of MPL attachments per 24 hours. Once Circuit Breaker is activated, no more MPL attachments will be persisted. If we return then to the case were it is only used for testing and only for a small period of time, the capabilities of a trace succeeds the logging of a script. I’m also looking what the best logging is. Perhaps the script can be useful as some way of tracking a small portion of the message?